Hardwood flooring is an excellent addition to any home, but many people think that it comes with a high level of maintenance and care. The reality is, once you get into a routine of cleaning you can keep your floors looking great for years to come without much effort. Today we will take a look at a few simple things that you can do as well as lay out a plan to keep your floors looking gorgeous all year round. The following guide will give you some tips on care and cleaning for your hardwood floors on a daily, weekly, monthly, and even yearly basis. Understanding how to properly manage your beautiful hardwood floors will save you a tremendous amount of time in maintaining them. The added benefit of a regular cleaning routine is that it will also improve the lifespan of your hardwood floor. The best way to protect your floors from scratches and other damage is with a regular dusting. Several high-quality microfiber mops can be used for hardwood floors; these mops use static electricity to capture dirt particles to clean your floor. Sweeping may seem like a good idea at first, but you must remember that when you’re sweeping the floors, you’re just pushing the dirt around the floor. This could also create a risk for scratches. For this reason, it’s recommended to use a high-quality microfiber mop. Daily sweeping will go a long way in defense of your floor by protecting your wood from dust and grit from falling between the boards or being ground into the floor’s surface. Each week, have a deep cleaning day to take the time to get to those hard-to-reach spots of your floor. Put away your dust broom and break out the wet mop and your vacuum cleaner. Be sure that if you use a vacuum, it is set for hardwood floors as you do not want the scrubber to contact your wood. When vacuuming hardwood flooring, the goal is to use suction to pull up any excess dirt in troubled areas like corners. If you feel that mopping is necessary, remember not to use an excessive amount of water. The intent is a gentle cleaning, not a deep soak; water and wood are not friends. Often a spray misting will work better than a bucket. Use caution whenever using new cleaners that you’re not familiar with and follow the machine’s instructions. If you are unsure of a cleaner, pick an area of your floor that you can use as a test patch to ensure that the cleaner will not harm your floor. Once a month, it’s time to treat your floor and give it a polish. 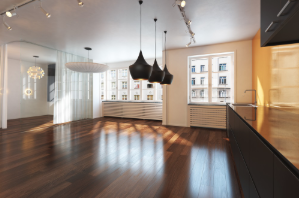 Polishing your floor reinvigorates the finish and protects your hardwood surface. Most hardwood floors have a coating of sealant. However, over time through wear and tear, that surface will begin to break down. The application of polish will help to rebuild that protective layer for your floor. Polishing your floor smooths the surface as the finish fills the imperfections in the sealant, giving your floor a beautiful new look. Once a year it’s a good idea to look over your hardwood floor for spots that need special attention. Do a visual inspection of your floor looking for gouges, scratches, and damage that polish won’t fix. When you identify potential boards that need to be replaced, now is the time to take care of them. After several years of wear and tear to your high traffic areas, your flooring might warrant the need for stripping and resurfacing. We should also make a note that you shouldn’t need to strip your floors more often than once every five or so years if they are well maintained. Taking care of your floor with daily, weekly, and monthly routine cleaning will save you time and money when compared to letting them go. You will be able to notice areas of concern before they become damaged spots that need repair, thus saving you a lot of grief and expense. Take a few minutes to check out another blog on our page that goes over several excellent simple care tips for cleaning hardwood floors. These would be great for additional reading to help you learn more about maintaining gorgeous hardwood floors for years to come. Work with a flooring professional to keep your floors functional and attractive all the time.